January 2013 - Touch Display Research, Inc.
Today is the second day of FlexTech’s 2013 Flexible and Printed Electronics Conference. It’s very popular with about five hundred attendees and sixty exhibition booths (flexconference.org). 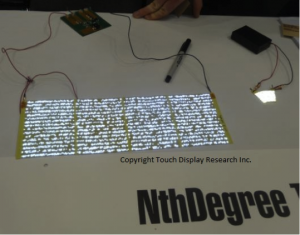 At Nth Degree Technology’s booth they demonstrated several types of printed LED lighting. One is a transparent blue LED light, two are flexible white LEDs (see image below), another is used as a signage. First, tiny blue LEDs were built using traditional wafer fabrication technologies. Then the tiny LEDs were mixed into a special ink. The ink was applied using a high-speed printing method onto conductive substrates (plastic or glass). If there is a need to change colors, a phosphor layer is added on top of the blue LED lighting. What kind of application will this flexible LED lighting be used for? What is the time-frame for this this lighting to come to market? What’s the comparison of printed LED lighting vs. OLED lighting vs. EL lighting? A detailed analysis will be in the upcoming Touch and Emerging Display Monthly Report, Feb 2013 issue. 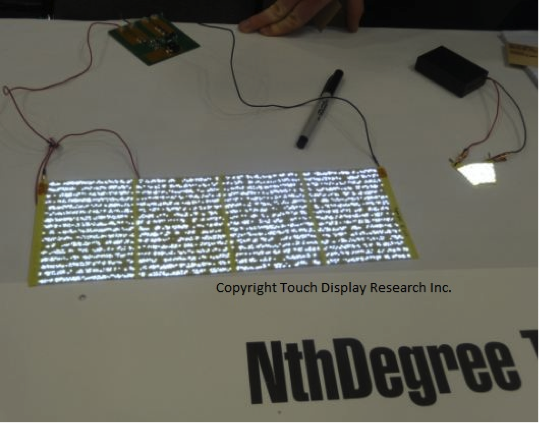 This entry was posted in Conference Review and tagged conference, flex conference, flexible electronics, flexible lighting, Flextech, LED lighting, nth degree, phosphors on January 31, 2013 by Steve Colegrove. I volunteered for SID (Society of Information Display) Bay-Area chapter, and helped with organizing the first 1-day “Display and Touch Technologies of the future 2013” conference as a conference co-chair. After 5 months of preparation, the 1-day conference was held on Jan 16th, 2013, and it was overwhelmingly successful with 160 attendees. Microsoft’s Jeff Han and Intel’s Achin Bhowmik gave keynote presentations. I had the honor to introduce the morning keynote: Jeff Han, General manager of Microsoft office division. Jeff Han was famous about promoting multi-touch since 2006, 1 year before the Apple’s iPhone in the market. Han was the CEO, founder and chief scientist of Perceptive Pixel since 2006. Han was named to Time magazine’s listing of the 100 Most Influential People in The World in 2008. His company was acquired by Microsoft mid-2012. 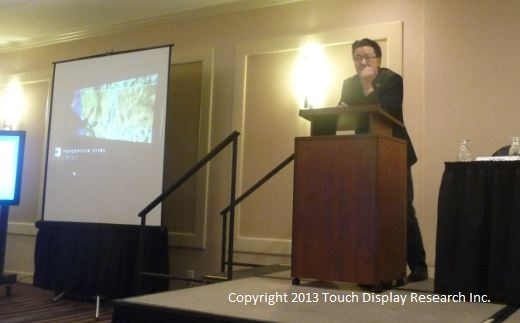 Jeff Han brought a 50” touch screen display demo to this 2013 conference. In his keynote, he first showed the video of touch being used by CNN for the president election news. Then he introduced some advanced research that Microsoft is doing. He walked to his touch display and demoed the touch and pen writing. He said, “When you are in the drawing mode, then you want to go to the next page, you do a swipe. But the screen shows you a line. Now you realized that you are in the drawing mode, not the touch mode. Then you have to go here, click this button to switch to touch mode. You see, that break the flow.” He emphasized that with simultaneous touch and pen technology, user can have the smooth flow. As Jeff Han emphasized that with simultaneous touch and pen technology, user can have the smooth flow to work on the touch display. Another touch company has touch and pen technology is N-trig. N-trig’s DuoSense had been adopted in several notebook PCs, such as the HP’s touchsmart 12.1”. DuoSense also was adopted in the HTC’s flyer tablet. The most successful (with the high volume sold) touch and pen device might be the Samsung’s Galaxy Note. It’s a hybrid of phone and tablet (some people call this phablet). The Galaxy Note’s touch is the combination of an on-cell projected capacitive AMOLED with a wacom digitizer pen beneath the OLED display. Samsung reported that the original Galaxy Note sold 10 million units in 10 months. The Galaxy Note II is even more popular, with 5 million units sold in 2 months. This entry was posted in Conference Review, Displays, Touch screens and tagged conference, Electronic pen, Intel, Jeff han, Large display, Microsoft, N-trig, Samsung, Time Magazine, Touch screen on January 23, 2013 by jennycolegrove. Touch Display Research, Inc, founded by Dr. Jennifer Colegrove, is an independent technology market research and consulting firm specializing in touch screen and emerging display technologies, such as OLED display, OLED lighting, flexible display, e-paper display, 3D display, near-eye display, pocket projectors, quantum dots, gesture control, voice control, eye control. Touch Display Research provides standard reports, consulting projects and due diligence for touch suppliers, display manufactures, consumer electronic ODMs/OEMs, material suppliers, investor companies, venture capitalist, and companies who are merging or acquiring companies in the touch screen, display and material industry. Touch Screens Over a dozen touch technologies, suppliers, industry trends. New materials ITO replacement materials, ITO-coated glass & film. Quantum Dots. Insight of the market trends through massive survey of industry contacts. Low price, (since we have no overhead). This entry was posted in Company News on January 9, 2013 by jennycolegrove.